Now the title of this particular song seems almost cynical, because “Gut gelaunt” translates to “In a good mood”. In 1942 that was certainly not the prevalent feeling of a lot of people in Germany and Europe. Some might disagree, but to me German swing music, like all of the culture that was produced in Nazi-Germany, no matter how sophisticated, will always feel stained. Simply because it wasn´t a threat to the dictatorship and it was made while millions of people were expelled, tortured and killed. But what were you to do if you were a very talented 22 year old swing musician living in a dictatorship? Zacharias chose to stay and keep playing and playing until Berlin was in ruins. And then he still kept playing. 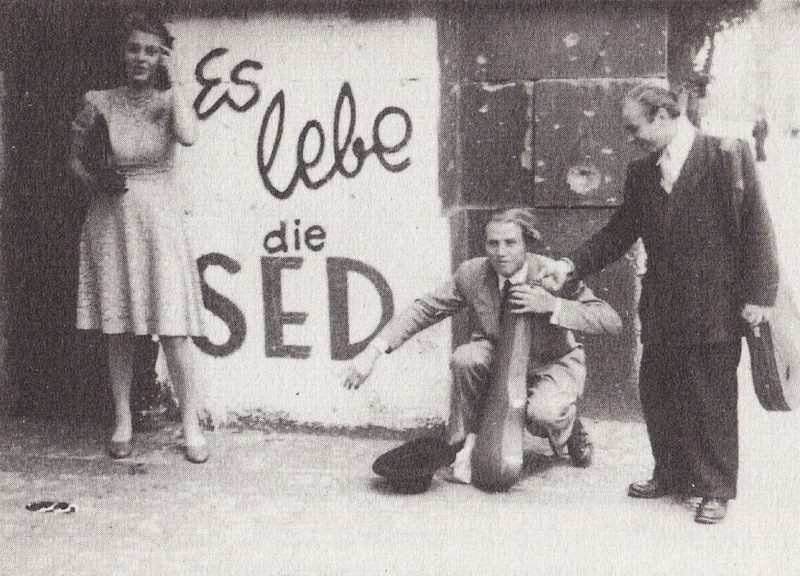 In this picture he is shown with his wife Hella and his friend, guitarist Coco Schumann, circa 1947 in front of a sign that says: “Long live the SED” (Sozialistische Einheitspartei Deutschlands – Socialist Unity Party Of Germany). Coco, a Berlin jew, had come back from Auschwitz and Dachau and immediately started to play with Helmut again, like they had done before 1943. The two swing enthusiasts, bound together by their love for the music, were now performing for Berliner Rundfunk, the first Berlin radio Station run by the Soviet military government. Into the late 40s they recorded together for Odeon, Amiga and Polydor. Naturally he didn´t shy away from Rock´n´Roll either. 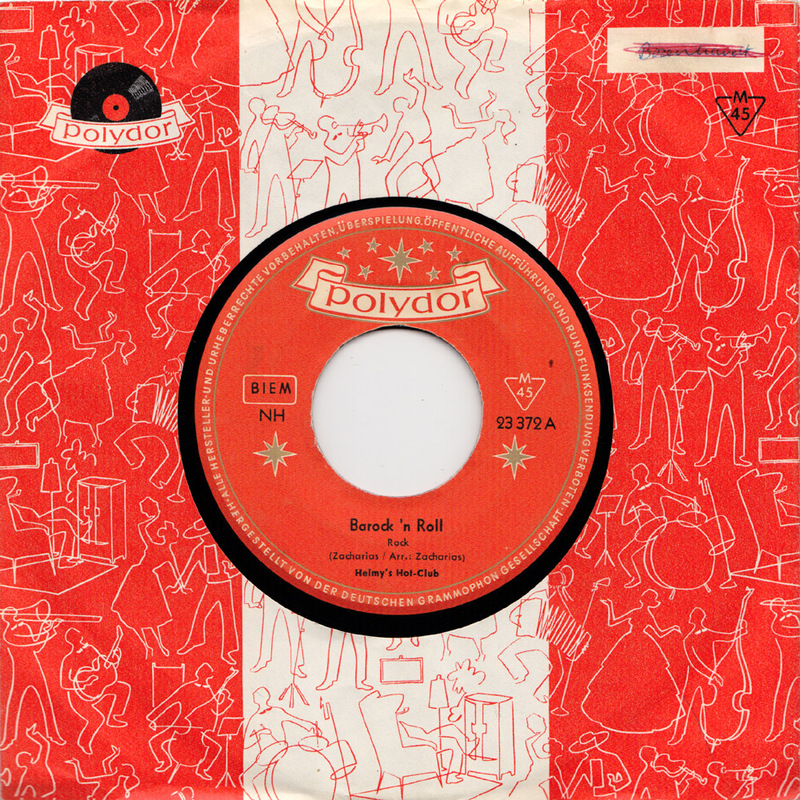 Henry Cording (aka Henry Salvador, the name is a word play: re-cording) recorded “Rock and Roll Mops”, one of the first French rock´n´roll songs in 1956. 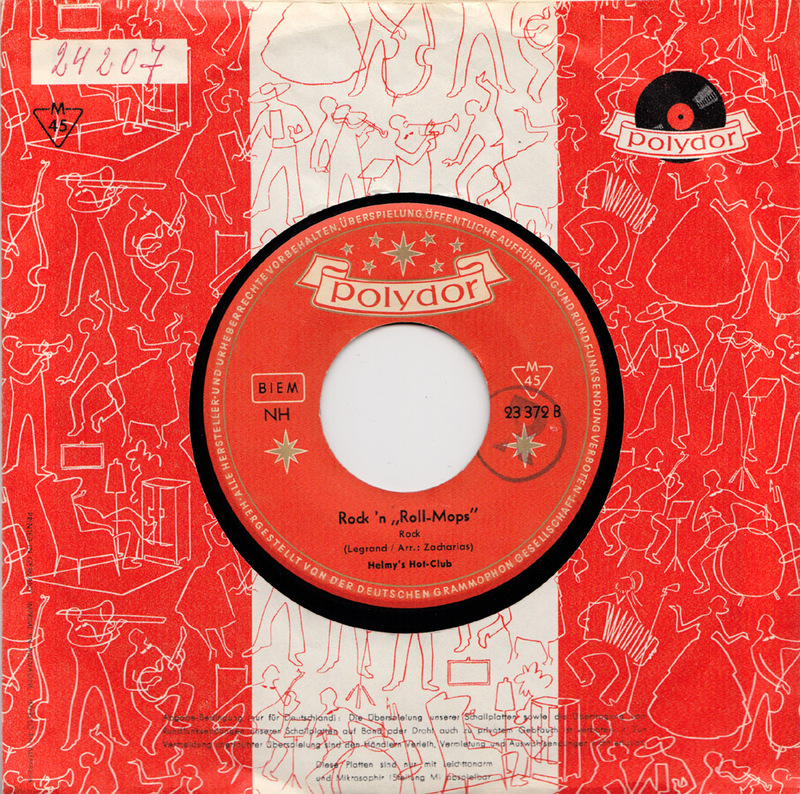 The lyrics were written by Vernon Sinclair, a pen name of Boris Vian. 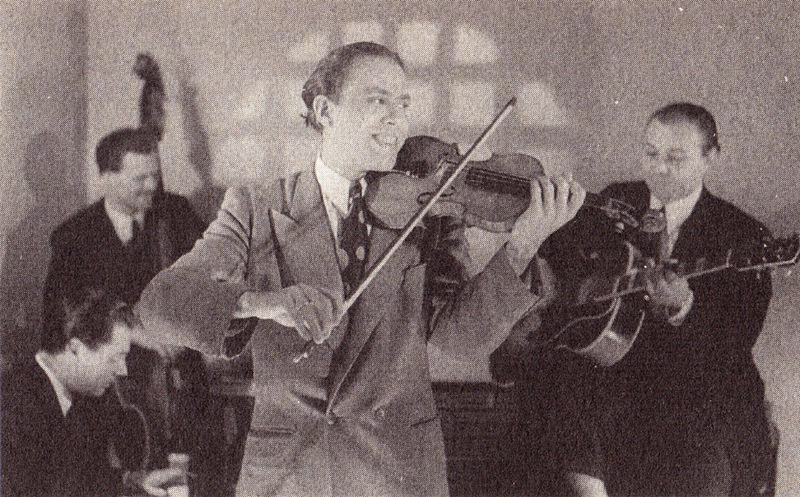 Vian, an accomplished jazz trumpeter, published his first poem in 1943 in the bulletin of the Hot Club de France, the association of lovers of authentic jazz. In the 30s and 40s Hot Clubs spread all over the world. Rock´n “Roll-Mops” plays with the words Rock´n´Roll and Rollmops. A Rollmops is a rolled pickled Herring fillet, a particular specialty of Berlin. Somehow Helmut Zacharias´ instrumental version has never been re-released, or at least I couldn´t find it anywhere. Check for yourself, if you´ll only find this post, I´m probably right. Dutch singer trumpetist Ferry ”Rock” Barendse made the ultimate Rock ‘n’ Roll mops version. I found the SP last year and it definitely was a jawdropping experience to spin this record, it sounds like Lionel Hampton jamming with Screamin’ Jay Hawkins. I’m quite sure that it is available in a couple of recent french 50’s Rock’n Roll compilations. Here is a link with a discography and a short biography (in french). I think I saw one of the French R&R comps you mentioned in a record store last week but bought something else instead. Will go into that store again and buy it tomorrow! Thanks a lot for the tip. I´m excited to her that version. Keep blogging!